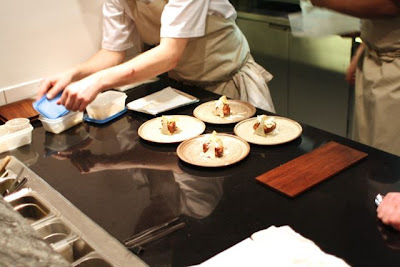 Frantzén/Lindeberg is one of only four Nordic restaurants with two stars in the Michelin Guide. So far no Nordic restaurant has ever managed to get the precious third star even if some are supposed to be close now. Frantzén/Lindeberg opened in 2008 and got their second star in 2010. Björn Frantzén and Daniel Lindeberg worked at locally famous Edsbacka krog, Sweden's first restaurant with two Michelin stars, before deciding on opening their own restaurant that so far has been pure success and their restaurant just gets better and better for every year. 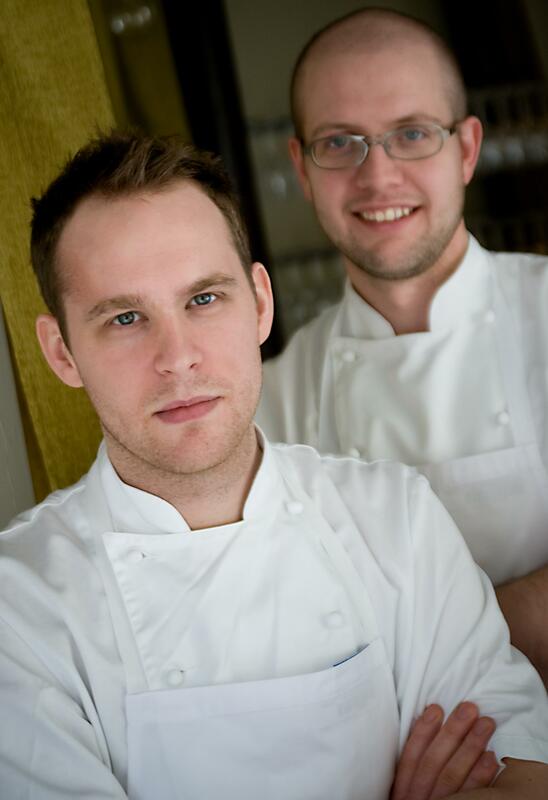 It will be no surprise if Frantzén/Lindeberg receives a coveted third Michelin star. They deserve it. You will have a 100 percent eco experience when you dine through the French inspired tasting menu with strong Nordic emphasis. There is only one set menu and it should be paired with the suggested beverage pairing. You are offered a list of the day’s ingredients upon arrival and what is created from the ingredients is presented to you over the course of your dinner. The concept works very well, indeed. 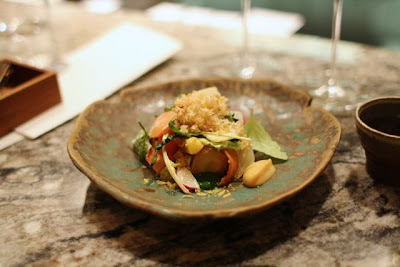 Since the restaurant is so small can the surprise elements of the almost perfectly assembled menu be lost, because you want to be pleasantly surprised when you dine at Frantzén/Lindeberg, but try not to look at any other table than your own and you are in for a treat. Björn Frantzén and Daniel Lindeberg belong to the new fresh wave of Nordic star chefs offering top international dining with strong focus on the nature and what it offers at the given season, but with a lovely intelligent twist to not make it too serious. The attention to the ingredients and especially vegetables sends your thoughts to the vegetable guru, super chef Alain Passard and it is obvious that he has given inspiration to the young Swedish chefs who now have taken the path to absolute international top class. 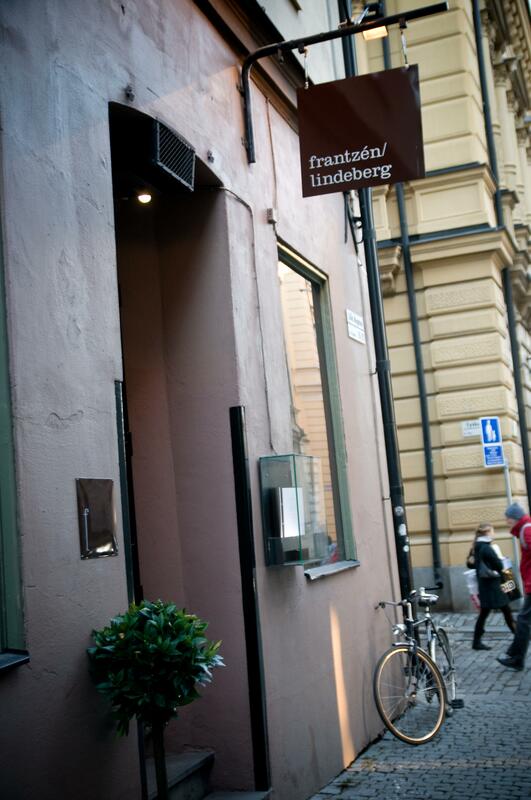 Frantzén/Lindeberg is a must when you are visiting Stockholm. Frantzén/Lindeberg scored 90 points of 100 points in our rating system. Owners Björn Frantzén and Daniel Lindeberg’s rise thus far has been nothing short of meteoric, with their restaurant Frantzén/Lindeberg gaining two Michelin stars within just two years of opening, and the pair are tipped for even greater things. To find out more about this special place read this! Can you explain your philosophy and vision of your cuisine? 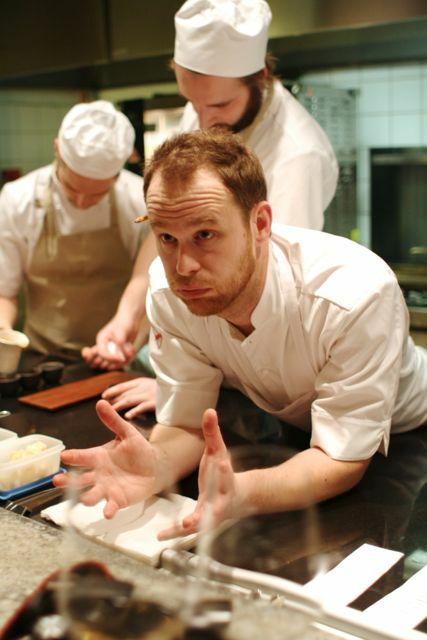 Tell us a bit about Frantzén/Lindeberg. What is the idea behind it? The idea behind the restaurant is to create a relaxed restaurant with a lot of personality. When you leave the restaurant you should have an opinion about us, what ever you opinion is. If we are talking about accolades obviously when you have 2 michelin stars you want 3 and of course climb higher up on the 50- best list. But the main goals are to keep on being fully booked and to have satisfied guest and to come in here and to try to be a little bit better day by day. Simply to keep on doing what we are doing but doing deeper. What is the future of gourmet cuisine? I think we will keep on seeing more and more simple decorated establishments where the owner will put his money into the amount of staff, wines, and food instead of fancy decorations. Japanese style. The small restaurant at Lilla Nygatan 21( formerly the location of beloved Mistral ) has been around for some years now and we were really looking forward for this evening because it had been over a year since the last time and over that time they have really been pushing forward striving to make everything even better. From the start it was a foodshow lasting over twenty dishes with many gimmics of that time and somewhat of a gastronomic rollercoaster ride….. and the stars didn´t wait for long. After the first year they got the first star and after the next year the duo got the second one, they also ranked in the top of swedish White guide and got the " the one to watch " title and placed them at 57 on the the Pelligrino list when it was released last time. The thing with the restaurant that impresses me the most is the way they source the products and how they now have control of everything thanks to the two contracted gardens and breeding there own animals. Björn Frantzen has been spending a lot of time searching for product to the menu and we were told that they now are serving around 95 % nordic ingredients ! Both of the chefs ( Daniel being a pastrychef and baker ) have a background at many michelin starred places like L´Arpege, Edsbacka krog and Raymond Blanc etc and it seems that they now have matured in to something that without a doubt is one the most interesting kitchens in the frontline of Scandinavian cooking. When we arrive at the restaurant we got a warm welcome by the doorman, and old gentleman called Roland and restaurangmanager Jon Lacotte. The restaurant only serves one menu and it´s being changed depending of what they think is the best for the day. The restaurant has got new furniture and carpets and is really giving a relaxed and comfy feeling. 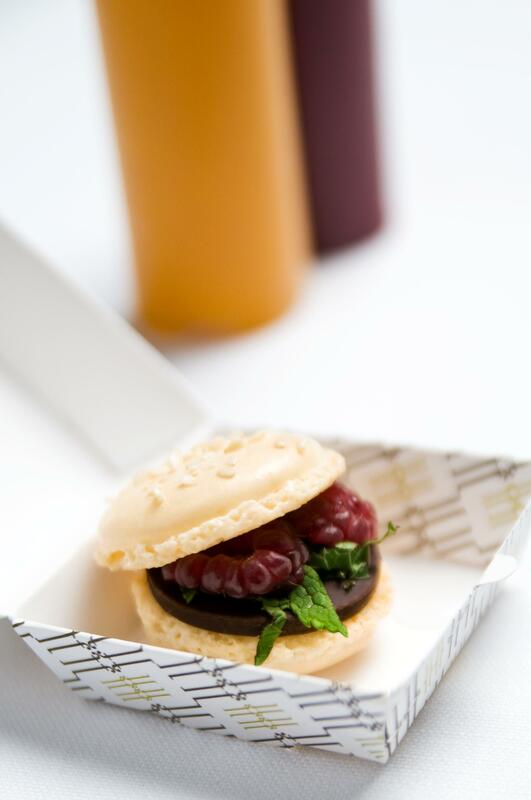 We started with champagne and the lightest of snacks… a macaron made of carrots filled with whipped duckliver, a smile on our face and a signal from the kitchen that this were going to be something special. 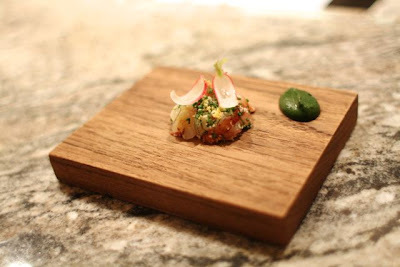 The highlight for me were first of all the hight standard on all dishes but if to choose some favorites it has to be the Norway lobster that is presented alive and then goes back into the kitchen and then transforms into the best of tartars. Two servings of roedeer is nature as it´s best, so good! 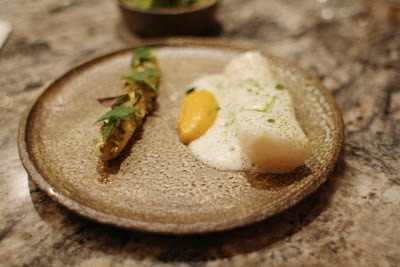 The scallop from Hitra is fantastic and the two fishdishes was so perfectly cooked….. If there is anything that I would comment is that the desserts in my opinion isn´t on the same level as the rest of the menu, but the macarons were of worldclass ! * SCALLOP from Hitra in two servings. 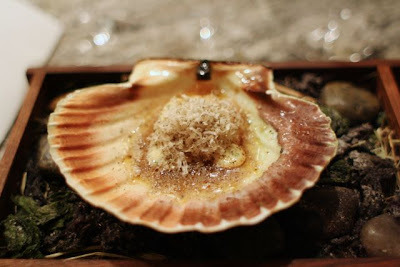 First the fired in its shell with salt butter and the creamy first egg from a Sanda hen, grated truffle, dried roebuck salt and it´s natural juice. 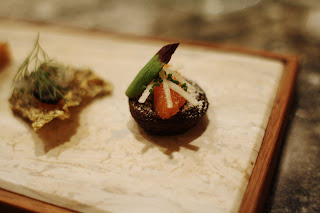 Second one is raw, marinated and dressed with roesack confit served with a bouillon of dried scallop, kombu, and forest mushrooms. (SWEDISH) Den nordiska vågen” kallas den grupp kockar från Skandinavien, framförallt från Sverige, Danmark och Norge, som under de senaste åren förknippats med det nya nordiska köket. Åtta ledande kockar kommer härmed att presenteras i en serie på tre delar. The Nordic Waves is the term I used to describe this group of chefs from all of Scandinavia, mainly from Sweden, Denmark and Norway. These chefs known for 3-4 years at international level have particularly been at the forefront over the past two years due to the recognition of New Nordic Cuisine and the emphasis on a cuisine close to nature and the local products. All this, without relying on the status attained by the restaurant Noma and Chef René Redzepi. But beyond fashions and trends of the moment, I discovered a high concentration of young chefs, innovative, creative, open to the world and all dedicated to their garden! To present the eight (8) chefs selected I decided to divide them into three little groups, not by country but by affinity. This last block of Scandinavian chefs presents two young chefs that are very original, creative and totally dedicated at their cuisine: Björn Frantzén (Frantzén-Lindeberg) and Geir Skeie (Brygga 11). Björn Frantzén has created with his long-time collaborator, Daniel Lindeberg (Pastry chef) a simple and accurate cuisine, completely inspired by what Nature does best. In the same line of thought as Chef Alain Passard, Björn Frantzén has a great respect for vegetables and he masters the art of cooking (cuisson). His philosophy: never shove the vegetables! In their small restaurant, the goal is to make the customer smile (see Question-7-) and to highlight the best product possible. See their obsession to find the best artisanal home made butter! 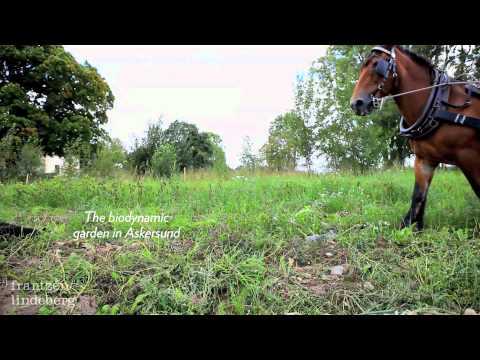 BFrantzén- Nature rules and decides what we should cook! We have no menu here that we can really go with what is the best for the day. We also would like to get a few smiles out of our guests. 2-(Scoffier) Do you have a mentor (chefs or anybody else) that inspires you in your cuisine? BFrantzén- Not really. But I have big respect for Alain Passard who is still actually in the kitchen and still cooks. 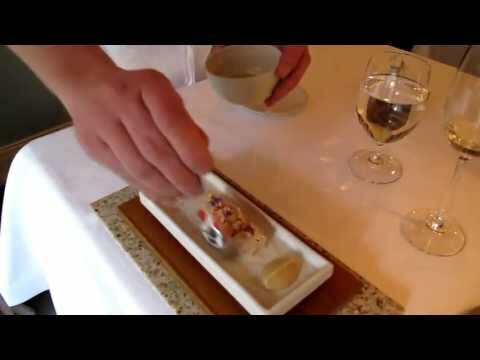 3-(Scoffier) I seen that you have worked at L’Arpège, what do you learned with the Chef Alain Passard? BFrantzén- Respect for ingredients, only use the best ones! Cook almost everything slowly. Do not use the oven to much. 4-(Scoffier) Do you have a particular foods (local products etc.) that you often use in your recipes? BFrantzén- Scallops, good butter and vegetables or what ever is in season. 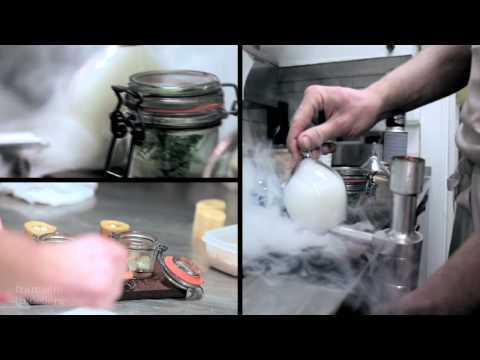 6-(Scoffier) How you construct your menu with your pastry chef Daniel Lindeberg; around a produce, special theme, finding the perfect balance between salted and sweet? BFrantzén- We have worked together for 12 years so we are very linked by now. We are constantly in discussion of changes and planning menus. 7-(Scoffier) I have read that you realized an experience for a Cheese course describe by the voice (on an iPod) of the actor Stellan Skarsgard, you try to stimulate all the senses with your cuisine? BFrantzén- Yes, that part is really only to try to get rid of the stiff feeling sometimes found at these sort of establishments. We trying to involve some humour in the dining. 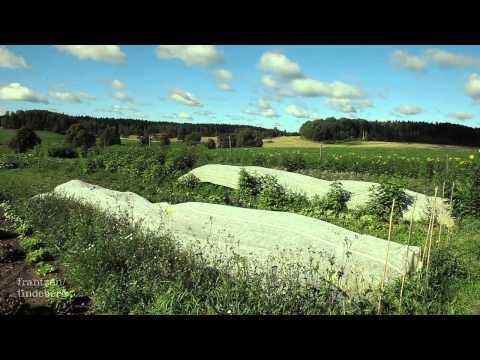 8-(Scoffier) Do you are part of the New Nordic Cuisine manifesto initiated by Claus Meyer and René Redzepi (Noma). If Yes, are you as strict (just local products) that René Redzepi in your recipes? Example: no olives oil etc. 9-(Scoffier) Do you use some elements from molecular gastronomy or new technology in your cooking techniques? If yes, which? BFrantzén- Sometimes, but not really. 10-(Scoffier) Can you give us a detailed recipe (signature or important dish) that is characterized the cuisine of Frantzén-Lindeberg? BFrantzén- French toast “à la maison” with truffle thé, silver onions, parmesan and 100- year old vinegar. 11-(Scoffier) What is your goal (ambitions) as a chef? Do you think to open another restaurant, write a book, a television show, others? BFrantzén- Three (3) Michelin Stars. 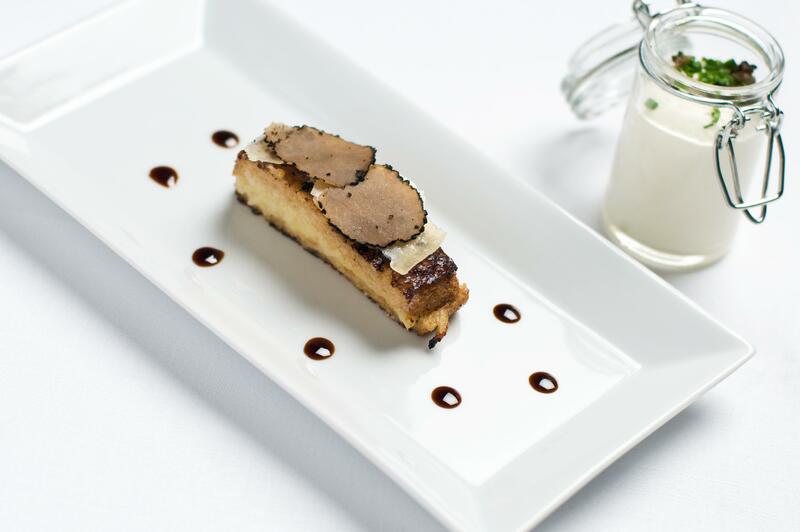 French Toast “à la maison” with Truffle Thé, Silver Onions, Parmesan and 100- year Old Vinegar. Originally I wanted to go when I was in Stockholm back in 2009, but I couldn’t get a reservation. So, when Björn wrote me back in June that he could not believe I hadn’t been to his restaurant yet, my visit was long overdue. I immediately wrote back and secured 2 seats at the new kitchen counter for Saturday evening on August 25th 2012. That’s direct marketing for you . This serving was a genius. 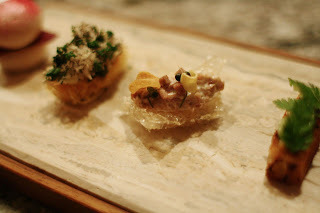 The bone marrow narrow meted on my tongue and its delicate flavour was enhanced by the salty, delicious caviare. For once it was nice that the morrow was not smoked. The smokiness was added with the parsley/smetana cream. Dear reader, dear food lover. Last week I got a call from my fellow food writer and friend enfoodie in Stockholm asking me what I was doing on the 1st of May. He asked if I was interested in joining him for dinner at restaurant Frantzén / Lindeberg in Stockholm. I had eaten there only five weeks earlier, so I was at first a bit curious why he wanted me back there. It turned out it was for the big event which got known publicly at 1st of May - that Daniel Lindeberg is moving on and leaving the restaurant. 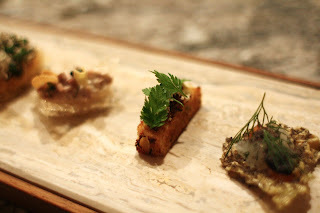 Rasmus from enfoodie has written an article on it, which you can read here. In addition you can read Björn Frantzén's own press release here. In addition the restaurant has been awarded number 12 in the world on the World's 50 Best Restaurants list. Well deserved! I didn't want to miss out on another meal at this restaurant, so I booked my flight and went to Stockholm. Our dear friend Trine Lai from Verygoodfood joined us in addition to Nadia Nygren from VisitSweden. We started off our dinner with some glasses of sparkling champagne at the neighbouring wine bar Gaston (which shares kitchen with The Flying Elk - the newly opened gastro pub!) before Björn Frantzén himself picked us up to show us the kitchens and the Corner Club, a cocktail bar that opened only weeks ago. Björn Frantzén told us eagerly about his new plans for the restaurant: many aspects were supposed to stay the same way as before and other things - as we were about to discover - would be changed. It was interesting to hear that Björn had gotten lots of inspiration from Japan and his resent visits there. Maybe would this show in the menu? From my earlier visit in March I noticed the same thing in some parts of the menu but this time it was somewhat a bit different. The restaurant will from now on have two seatings, where only half of the restaurant will be booked for the late seating. The tempo of the dinner will be higher - each meal lasting for roughly two and a half hours. At first we got served a plate with six different canapés - they were all very delicious and well tasting. 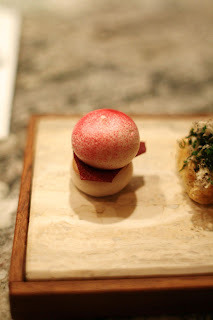 My favourite was the cod skin and the macaron of pomegranate and galangal root. Each and every one were unique and delightful: here Frantzén shows what a master he is when it comes to combining flavours - sometimes a bit strange at first sight, although nothing but pleasing when being eaten. Fantastic. Canapés - different teasers to start off the meal! I love how the perilla tastes almost a bit like fennel! of pig in truffle juice on top of crispy pig skin. both the cherries and the pomegranate. 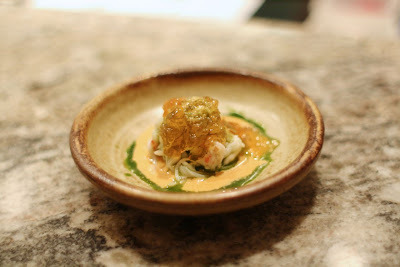 King crab, beer and dill. After the series of canapés we went straight on to the next part of the meal: the appetizers. First serving here was a beautiful plate with king crab poached in beer and dill, a broth on the decoction, dill juice and a paste of the brown crab meat. Oh my gosh, wasn't this just a fantastic dish! I don't think I have ever eaten such a well-tasting king crab before - it is so rich and deep in flavour! The meat was incredibly juicy and naturally sweet. In this dish I also like how the beer and dill play a vital role, making the flavours of the king crab come out really well. Top notch! 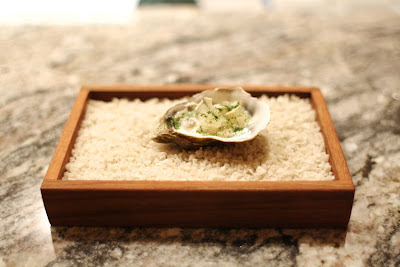 Oyster "45 min" with elderflower, butter, seaweed and walnut. 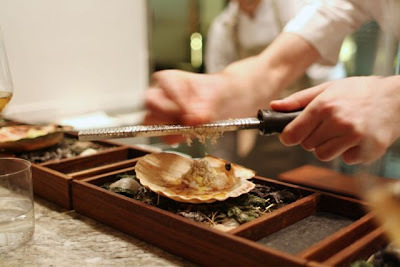 Frantzén's infamous oyster serving cooked en sous vide for 45 minutes: On top was frozen elderflower in addition to a butter flavored juniper, dried seaweed and walnut. This was supposed to be eaten all-in-one and the first thing to hit the palate was the frozen elderflower. It was citric, juicy and very refreshing. After only a couple of seconds the elderflower disappeared and made room for the creamy oyster. It was such a joy to eat. The walnut went really well with it. 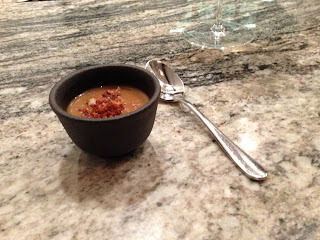 This was a tiny cup of pure joy: a purée made on Jerusalem artichoke purée with blond miso. Fried chanterelles and hazelnuts, some chicken skin and brown Jersey cream. It tasted very good and the quark in the bottom was good as a refreshing element in this dish. The fried chicken skin and chanterelles on top added some crispiness, which was satisfying. We moved on to the next part of the menu which was named "sashimi". This suited us well after the rather heavy bread soup. 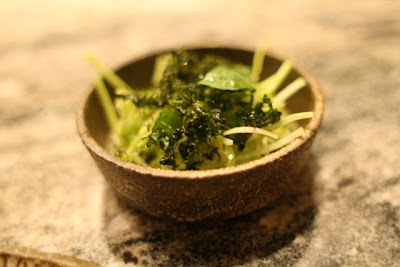 The first of the two sashimi dishes was a Swedish lobster with an emulsion of algae and lemon. On top were radishes and freshly grated horseraddish. The lobster was a bit chewy but tasted wonderful. The citric notes of the emulsion were quite good and the algae added depth which was a nice contrast to the lobster and the radishes. 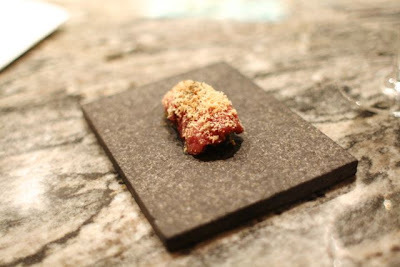 The next sashimi serving looked much like a nigiri: Swedish Wagyu beef from Anders Larsson with a chanterelle mayonnaise in addition to coriander seeds. Underneath was some very delicate and crispy sphagnum moss, and freshly grated frozen liver on top. This is almost as good as it gets: it has an aroma which is sweet and powerful - deliciously mellow. The texture is a bit chewy at first but is very tender and melts on the tongue. I like how it is very rich in flavour and the moss underneath gives a good contrast in texture. - I forgot to capture this moment! 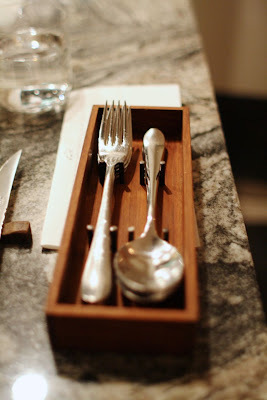 As you might have seen, Frantzén used to have bread serving where the bread was leaved to rise table-side. According to Björn he thinks the bread serving is redundant and unnecessary - "Do we really need these carbohydrates and dairy products?" Interestingly, as a 'replacement' of the bread serving, we were now offered a bread soup that they have been working on for the last eight months. We did not miss the bread after eating this, that's for sure. I must admit I like the idea of, and the theatrical aspect, of having a bread rising table-side. My friends know that I can become like a six year old with a bag of candy when being served bread and butter in a restaurant but interestingly I didn't miss it at all. The soup was made out of fermented rye bread, cep mushrooms, broth and heavy loads of cream. Some bread crumbs on top. Nutty, creamy, fatty, sticky, fruity and sweet. All at the same time. This was nothing but perfection and considering the amount of work put into this soup, it can't be called anything else. I think it had some garlic-y notes. It had a delicious and creamy aftertaste which reminded me a lot of cloudberries - the same exotic flavours. I like how the crispy bread crumbs added an extra dimention to it. Wonderful. Mr. Björn Frantzén himself telling us about his ideas! Juice of pea shoots and apples. The next dish to come was a signature dish of Frantzén named "Satio Tempestas" (meaning something like "satisfying fullness after season"). 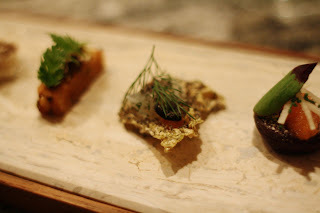 According to Björn this dish is composed out of the ingredients they can get from their two gardens that day and is therefore some kind of "theme of variations". Today this dish consisted of some fourty ingredients: Swedish sea salt, homemade butter, fish shells from a bream fish, yellow carrot, orange carrot, white carrot, purple carrot, turnip, parsnips, yellow onion, red onion, yellow beet, red beet, potatoes, parsley root, Jerusalem artichoke, calvo nero, red cabbage, eggs, salsify, kohlrabi, normal cabbage, Savoy cabbage, garlic-mustard, nettle, root celeriac, chikory, dandelion greens, dead-nettle, sorrel, garlic shoots, ferns, tatsoi lettuce, ramson, radishes, broad beans, pea shoots and winter apples. Quite. A. Lot. It is very complex in texture since the vegetables are marinated, boiled, dried, creamy or fried. I like this a lot - so full of flavour in every bite. Each spoon we take tastes different from the other and is unique. 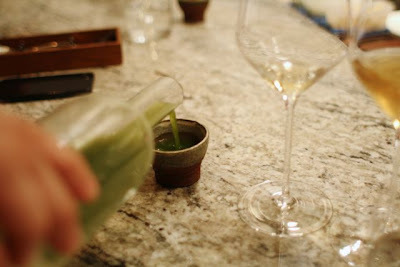 On the side we got served a juice made of pea shoots and winter apples. It was very citric and tasted a bit of grass - the perfect drink to such a dish. It made me really happy because it I suddenly realized that spring has come! Summer truffle on the top. Scallop serving I: a scallop from the Norwegian island Hitra (where my family has got a summer house!) grilled over open fire in the shell. On top was a cream made on eggs from an Iberico goose, in addition to summer truffles that were freshly grated in front of us. It tasted marvelous. Scallop broth and Frantzén's "dashi". 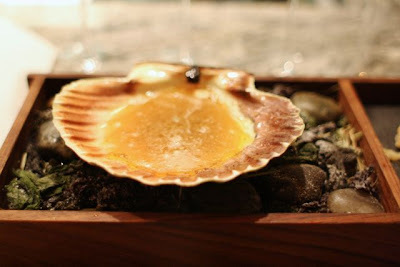 Scallop serving II: the leftover broth from the scallop was now used in a second serving where Björn Frantzén's own version of a dashi were poured into the shell. 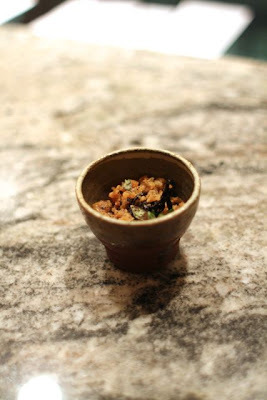 The "dashi" was made of chanterelles, dried scallops and dried seaweed. Umami bomb, indeed! It was was so rich in flavour and quite remarkable. I think this is one of my favourites this evening. The scallop tartare was very elegant and well-tasting. I think it had some ginger in it, which was to my taste. To quote one of my fellow eaters this evening: "This is three-star food." Fish of the day with asparagus. A salad on the side of raw leek and pickled cabbage. The following dish was named "fish". 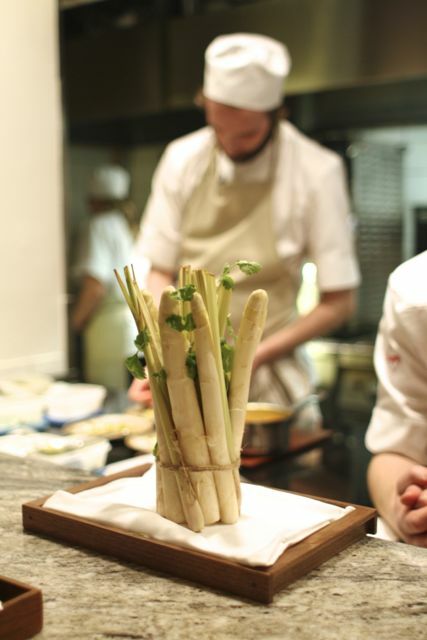 It was served with asparagus and was beautifully presented to us (as you can see above): the white asparagus from Holland had been baked standing up for three hours with lemon grass, lime coriander and spruce. In addition there was a delicate cream of saffron, lemon grass and some pistachios. The sauce on top was made from the broth of the baked asparagus. I must admit that saffron isn't my thing, so the cream was a bit too heavy for my taste. However, I can see that it added something interesting to the dish. 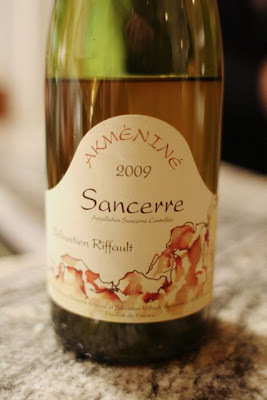 The asparagus was very juicy: I love the mixture of the citric notes of the lemon grass and lime in combination with the spruce and pistachios. The fish was perfectly cooked and tender. 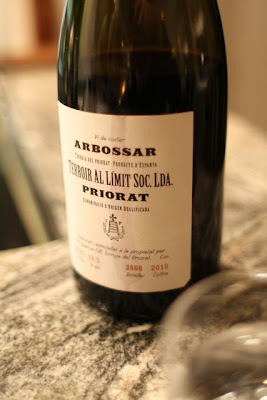 Arbossar, Terroir al Límit, Carinena, 2010. Preparation of the meat dish. Butter fried sweetbread perfumed with liquorice. Coming up next: main dish of meat. Here some veal sweetbread were perfumed with liquorice. It was served with grated almonds, diluted artichokes and a purée made of artichokes. 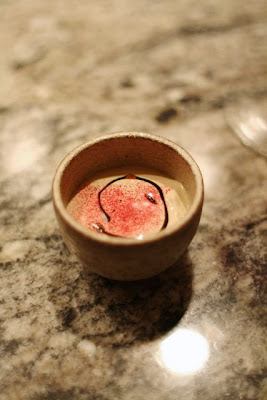 The cream on the side was a caramelized emulsion made of yuzu, browned butter and almond oil. The sweetbread was of exquisite quality. 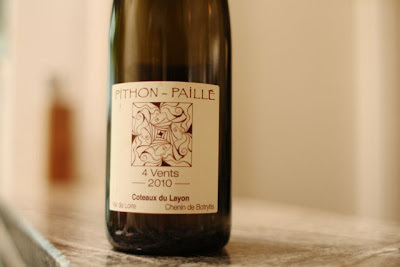 I like the light taste of liquorice which has a slight cooling effect on the palate. Some more of it would definitely have been too overwhelming so I liked that it was kept this way. 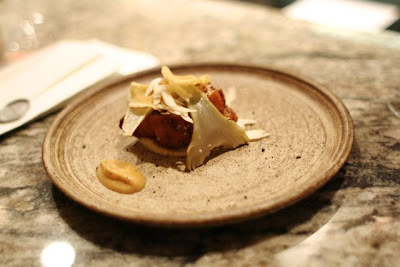 The thing that stood out here, in addition to the sweetbread, was the yuzu emulsion: it had a perfect combination of citricity and fat, and the almond oil added the little extra. This was divine! The first sweet dish of the evening was one I also got the last time I visited the restaurant six weeks ago: it almost brought tears to my eyes to see that we could have it one more time! It consisted of red beet, blackberry jam in the bottom, frozen black currant and a liquorice cream. On top was some 100 years old balsamic vinegar (!). This is one of the best desserts I have ever encountered. All I could think of after it mysteriously disappeared, was that I wanted one more portion of it. It is elegant in so many ways: the deliciousness of the blackberry jam and the sweetness of the beets. The thing that stood out to me here, was the good balance between the liquorice and the balsamic vinegar. I couldn't believe we were already coming to an end - well, almost. The second and last dessert was brought out to us: a cream of ginger and chrysanthemum in the bottom. Over this was an ice-cream of heavy cream that had been smoked and oven-baked, then slightly perfumed with lime. In addition it was served with tar sirup and an oil made of mountain birch. Ginger crumbs and dried meadowsweet. This dessert is complex in many ways but it strucks me how simple and light it is - not too heavy as many desserts tend to be. 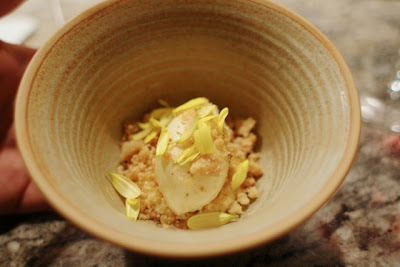 The cream of ginger and chrysanthemum was totally delectable and the ice-cream just as much. 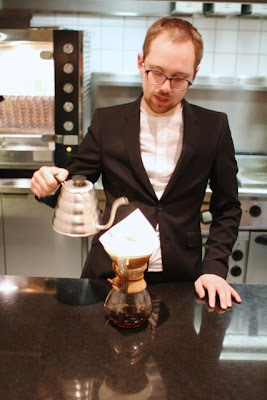 Sommelier Niklas Löfgren and his chemex. The evening suddenly came to an end - after roughly two and a half hours of pure bliss! Björn told us on his thoughts on how a meal like this should end in his opinion. We were all quite full and since the tempo had been quite high, there hadn't been room for many breaks. However, Björn concluded that the only thing he himself wanted after a full tasting menu was coffee and a piece of chocolate. 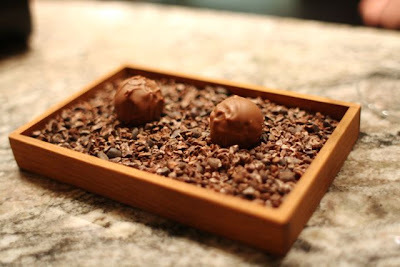 They have actually been considering back and forth on which petit fours they should have: the only thing that would match the light-roast coffee perfectly was actually such a piece of chocolate. It was very delicious and was made of manjari chocolate. Inside was some caramelized milk which was very creamy and sweet. The coffee - as usual - was brewed by sommelier Niklas on a chemex brewer. The coffee was from Johan & Nyström, a Swedish coffee roaster and tea shop. It was a Kenyan coffee - Kagumoini from Nyeri (sl 26 and sl 34). It had lots of citrus notes to it, flowers and lemonade. Almost tea-like. 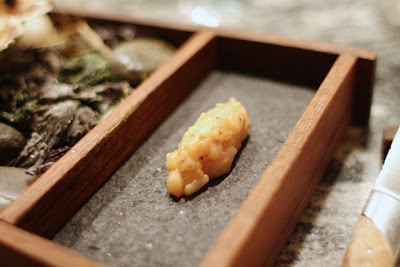 It matched the little petit four with its high acidity and flavour profile. In the end we got to taste four kinds of local liqueurs - my favourite here was a grappa-like liqueur with sea buckthorn. 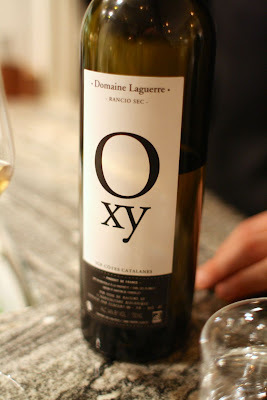 The sea buckthorn flavour was very clear and distinct, and I found it fresh and fruity. 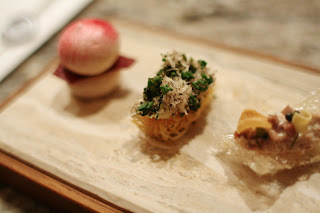 The "new" restaurant Frantzén has changed in a good way. Although I usually like long dinners with some intervals and breaks, I must admit that the rapid tempo suited me. It is clear that chef Björn is greatly affected and inspired by Japanese cuisine and it is important for me to underline that this is done with great perfection. 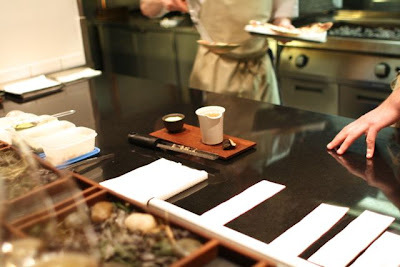 It is not like they try to copy Japanese cuisine but they tend to get inspired by many of their techniques and methods of cooking. 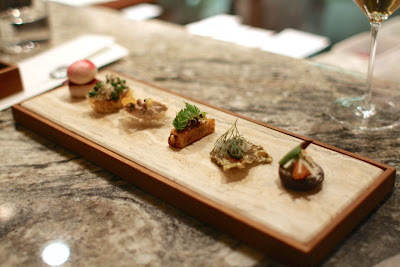 This is also shown in the higher tempo; the philosophy and thinking around what a tasting menu could be like. 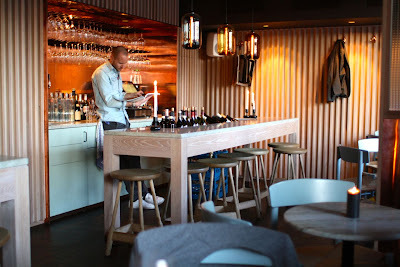 One other thing I would like to mention is how great an institution restaurant Frantzén has become: in addition to the bastion of a restaurant you now have the opportunity to have a glass before and after dinner in one of the neighbouring spots. If you go there yourself, I recommend you to book table for a late dinner, but start the evening a bit earlier at either Gaston, the wine bar, or The Flying Elk, the recently opened gastro pub. One can even start off with a tiny cocktail at The Corner Club. Do as we did: warm up with some delicious snacks such as gougères with cheddar cheese, croquettes of veal tongue and mushrooms or an "umami sandwich" with chicken, butter flavoured with chicken broth and soy sauce, herb salad with a truffle and sherry sauce, together with oyster mushrooms and parmesan. Check out my instagram account if you'd like to see some more photos from this evening. 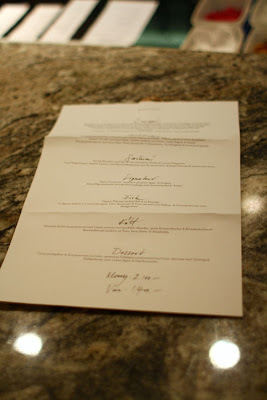 Our dinner this evening symbolized a change of times at restaurant Frantzén. In the following months and years restaurant Frantzén is a place where new and big things will happen. Frantzén's food is clearly "game-changing Scandi cooking from Sweden's hottest talent." Thank you to Björn and his team, and Rasmus from enfoodie to let me take part in this dinner! !